I was so excited to celebrate the first day of Spring this week. Even though we, Southern Californians, are pretty spoiled with warm weather all year round, we too crave that special spring sun in the blue sky and that special fragrant breeze from blooming cherry trees. 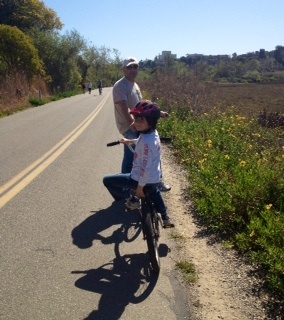 In our household, the warm Spring weather also means the start of our bike rides to the beach. So early in the morning we stuck our noses outside to make sure that the weather was just as what Siri informed us the night before. Our noses confirmed that the day was going to be beautiful and, as I was finishing my coffee, Varuzh made sure the bikes were in good condition and ready to be ridden. Once we put sunscreen on, we were off to our ocean side bike trail. I stuck headphones into my ears, turned on the iPod and I rode off. Luckily, after a long winter hibernation from biking, I still retained my riding skills and rode till I got to the top of the steep hill. I stopped abruptly. Oh, I totally forgot about this hill! I always walk my bike down this hill because, really, I always get scared to fall and hurt myself if I zoom downhill. Just the thought about it made my body almost feel the pain of the fall. As I was cringing, Varuzh and Alex sped downhill. “Mommy, go! You can do it, mommy!” I heard. I turned off my iPod and put it in my little bike basket. Should I do it this time? Seriously, if everyone can do it, why can’t I? Scared? Scared of what? So what if I fall? Should I dare myself? What’s my reward if I do it?.. But just like everything I do in my life, I decided not to think much and also not to let my fears take me over. Besides, I knew that the sooner I got there, the sooner I would land into a beautiful scenery of a wild river streaming down to the ocean. As I was uncontrollably speeding, the wind was hitting my face with its rough but warm touch. I let my fear go and let the wheels of the bike guide me. “Great job mommy!” both Alex and Varuzh applauded me. I dismissed them as if it was no big deal. But somewhere deep inside I was a little proud of myself for not letting my fears stop me from doing what I want. The trail was about six miles roundtrip and it was everything I remembered it was. 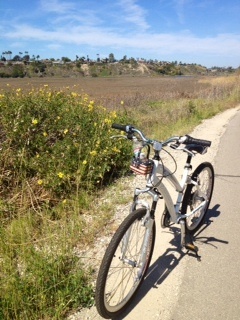 The gorgeous warm and fragrant air embraced me during the rest of my ride. I never turned my iPod back on because the nature’s sounds and beautiful view were enough information for my senses. 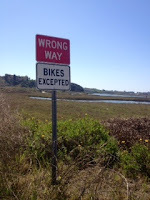 I missed biking, I thought. I missed summer weather, the outdoors. I am so glad that spring has arrived. Maybe I should bike everywhere, I thought. I could bike to the market or to the post office, movies, coffee shop or local restaurants, or wherever else two wheels can go. I relayed my idea to Varuzh. As usual, he smiled and said that it was a great idea, if I would actually do it. Well, I thought that this is certainly a healthier and so much more fun to move around on a bicycle than driving a car to a place that is a half a mile away! So lets get our bikes and go places!